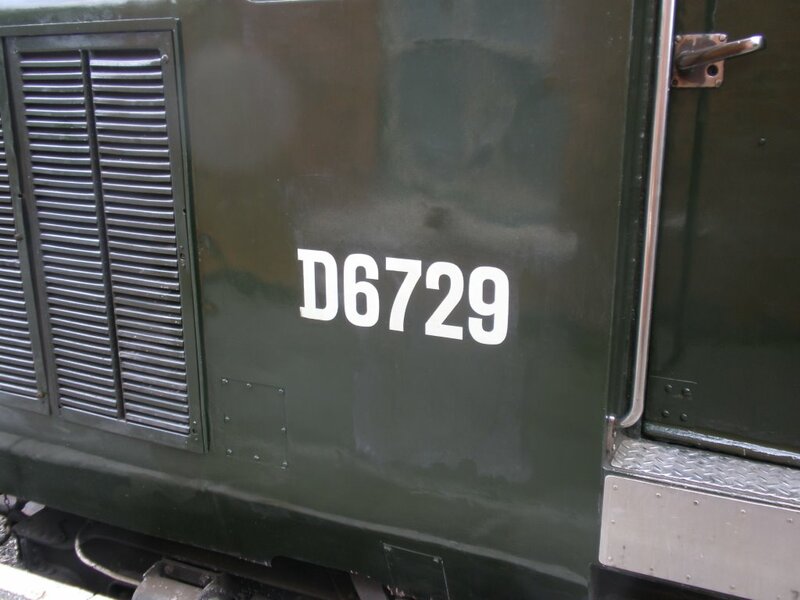 £5 Diesel Locomotive Cab rides: Recently, the Railway has increased the use of our home fleet of Diesel Locomotives at the weekends. This has proven to be one of the great successes of this season. 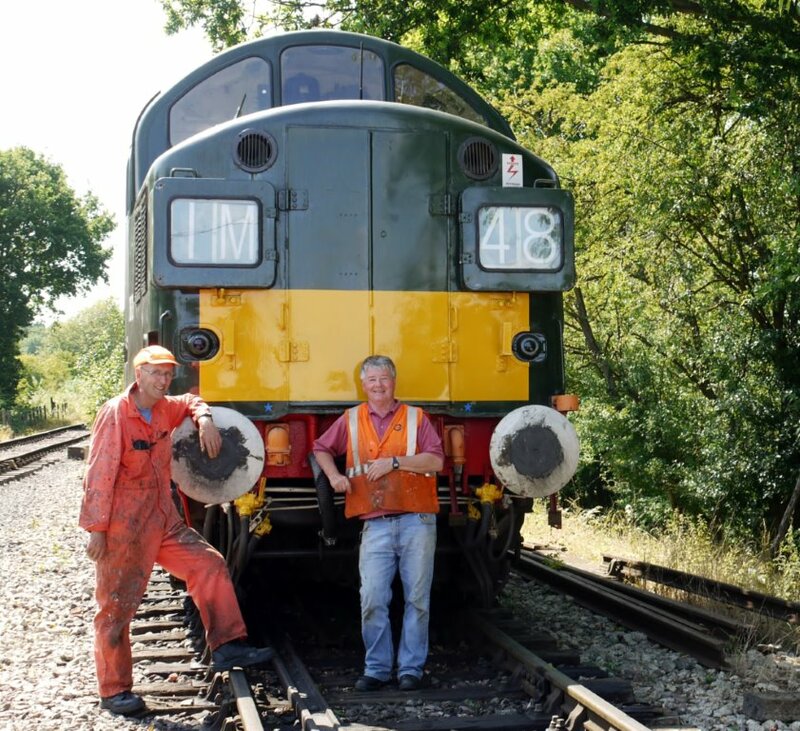 To help pay for the additional Diesel fuel bill incurred in running these hundred-ton giants, we have arranged for cab rides with the locomotive driver to take place, for a donation of £5.00 towards the Diesel fuel fund. One Sunday, we actually had a waiting list of passengers wanting to ride on the class 37 locomotive. They all seem to have a fantastic time. To get one of these, speak to and show the diesel driver your valid travel ticket, pay the £5, then enjoy. 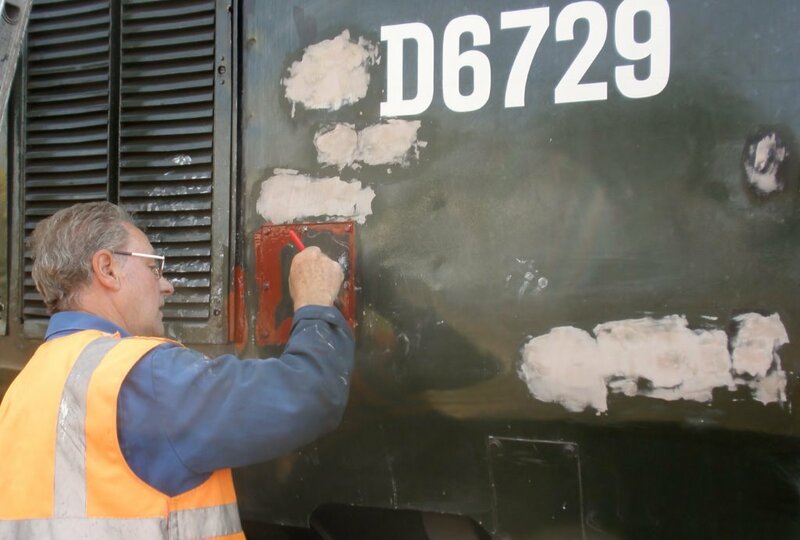 Since the completion of the class 37 Locomotive Driving cabs refurbishment, the team have been working on the exterior of the Locomotive. The cause for most part was internal, with dust and dirt wedging between the external body work skin and the supporting frame work becoming damp. Rusting can also form around gutters that become full of damp debris. There was no real method of rust proofing used on this type of Loco; as it was reckoned to have a design life of about twenty five years when built, rust would not have been an issue. Add a further twenty nine years on to the design life, rust and corrosion is a real ongoing problem. There is a rusted area around one of the gutters, which will need to be re-plated with new metal. This is a highly skilled welding and fabrication job. …before moving on to cutting out rust on one of the gutters. A rust-proof coating, followed and filler is the next stage of the job. Graham adds a coat of Red Oxide to help protect the area. What follows are several sessions of rubbing-down, to create a smooth surface, followed by two thin undercoats and the final top coat application. 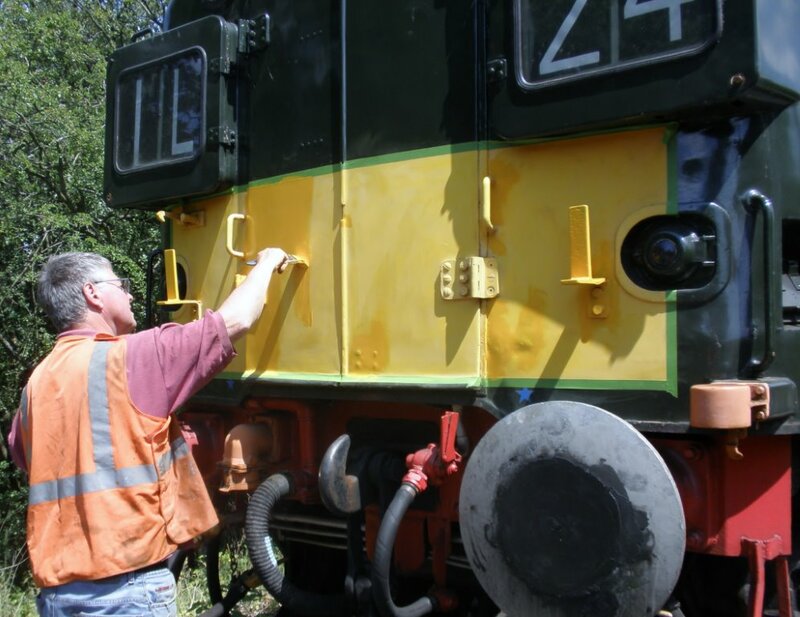 We are also carrying out repainting of faded areas such as the yellow fronts and buffer beams etc. 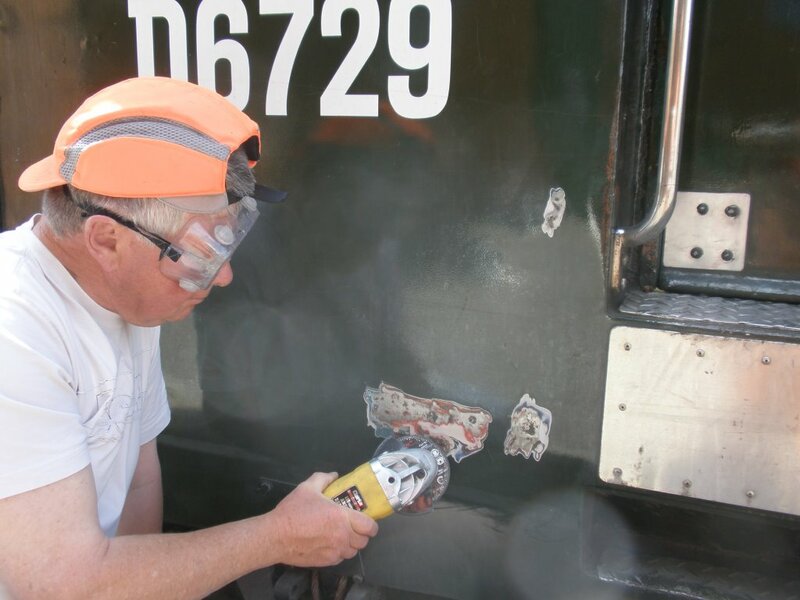 Mick continues his work across the class 37 bodywork, and soon finished up the area on the yellow warning panel. The class 37 along with the 31 has been working most recent weekends. Both Locos have also been used recently on several occasions for filming work. Looking ‘cool’ on an otherwise hot day – some of the team pose to show off their handiwork. The loco is in denial about her age, claiming to be 6 years younger than she actually is; the headcode boxes have done well for 54 years, and now have new light fittings. All external lighting has also been rewired, and is now fully functional once again. 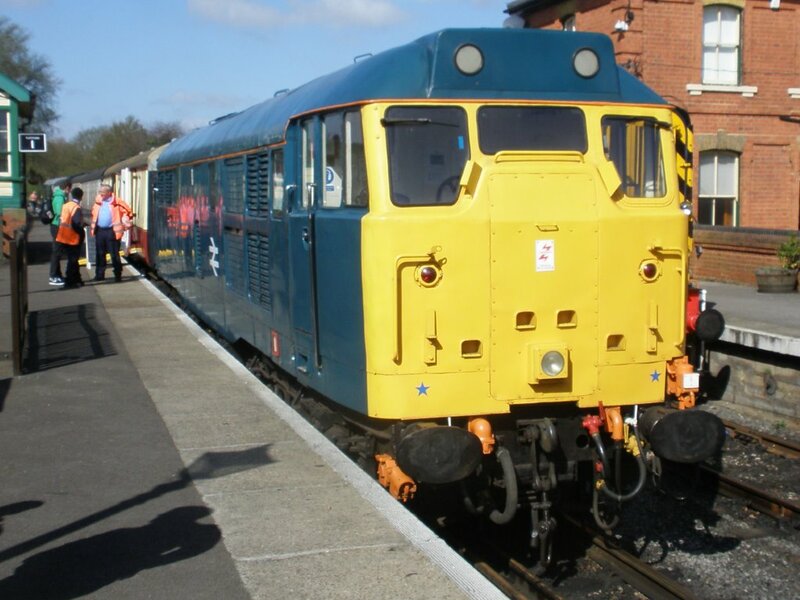 The Class 25 was withdrawn from service some time ago and was transferred to ‘HTRS railway engineers’ (based at the Shackerstone Station on the Battlefield Line) for body refurbishment and other remedial work. 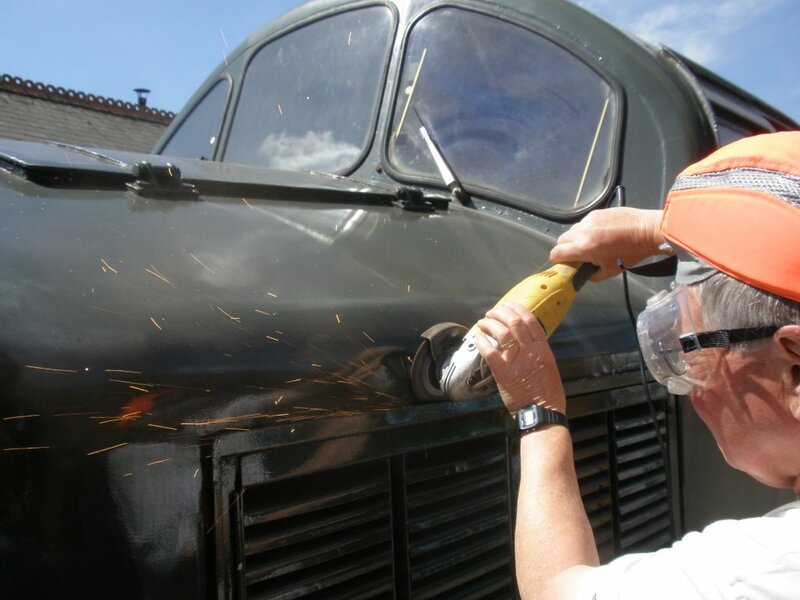 The engineers – Simon and Adrian -have sent us photos of number two cab to give some idea of progress made. Closer up to the sub-floor area, which gives a rough idea of just how the lightweight cabs were built. The rebuilding starts here. On the left is the Drivers desk, and the second man’s position was on the right. 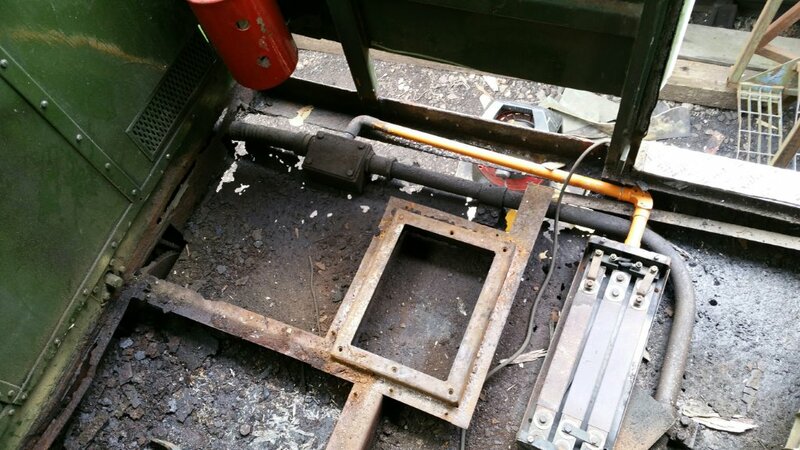 This is all that is left of the sub-floor of number two cab after our external engineers’ started to cut away the wasted metal and clear the rust. 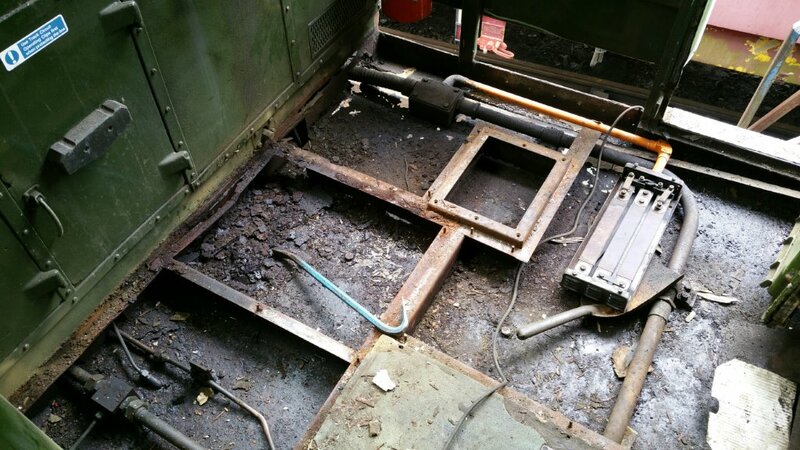 In the photos, the cab floor has been almost completely removed, exposing the metal sub-floor (or what’s left of it.) The Locomotive’s lightweight construction can be clearly seen from the photos. The cab walls were single skin; Diesel Locos were not built to be totally water proof – the trick was to ensue water drains out the bottom of the Loco (clearly not the case with our class 25.) Internally, water pooled on the intersections of the main structure, causing extensive rusting to external panels from the inside. Water also built up under the main cab floor. Looking at the pictures, it does not look like the engineers have a lot of sub floor framing to weld to. (Interestingly, you can see the small shovel and crowbar the guys had to use to clean the rust and debris from the sub floor.) To right of the pictures, you can see where a large section of the rusted cab wall has been cut out. Whilst we are all looking forward to the loco’s return, it could be some time yet. The Class 31 Loco has been in almost daily use since November. She is proving to be a real work horse. At times she is just too good looking; despite being in constant use, she is very clean and polished. Recently, whilst she was sitting in the platform, awaiting her next working, some of our non-railway visitors believed she was a non-working museum piece. Considering she was withdrawn from main line working nineteen years ago, she doesn’t look too bad at all. A recent picture of our Class 31 Loco, looking very clean and shiny. She is proving to be a real maid of all works, from providing electric train heat for our winter passenger trains, right through to the run of the mill – but essential – engineering trains. She has also, with our class 37 Loco, ‘starred’ in some recent filming work. Both of our Class 03 shunt locos are in use at North Weald, as depot and Station pilot engines. Body work and cab of 03170 are in good order, having been refurbished at North Weald. However, while a great deal of work has been completed on 03119’s diesel engine, the bodywork and cab are still on our hit list. 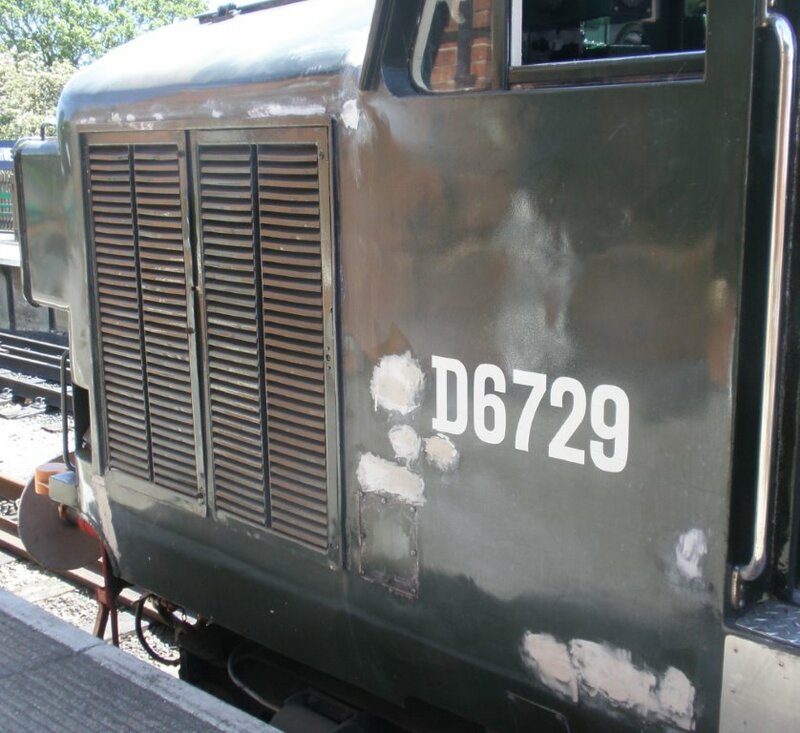 You may recall that our engineers have spent a great deal of time and money in resolving a number of electrical and electronic faults – they completed repairs only to experience a compressor failure while testing the loco. After examination of the auxiliary machine, a decision has been made that will have to be replaced by a refurbished machine. There is also an issue with water ingress from some of the roof sections; plans are in hand to remedy both faults as funds become available. At the moment, she resides in the back of number two road in the shed to keep her out of the rain. The Thumper is use on most passenger workings. Our colleagues in the C and W Department have replaced a broken driving cab emergency door window, after the window spring-operating mechanism ‘self-destructed’, smashing the non-standard size window in the process. The same guys have also repainted most of the luggage compartment walls grey, and roof white. Michael Fisher is in the process of finishing the replacement of one complete wall, and the last few touches to the celling. As previously reported, C and W guys have continued to replace the worst of the passenger seats with new Network Southeast pattern material. They have been using material recovered from the damaged/worn seats to patch others. I am very impressed with the standard that has been achieved. We have now run out of our stock of Network Southeast material – if you have access to any, please get in touch. The team working on the peak are making excellent progress rebuilding the Locomotive. We are Looking forward to seeing her in service.